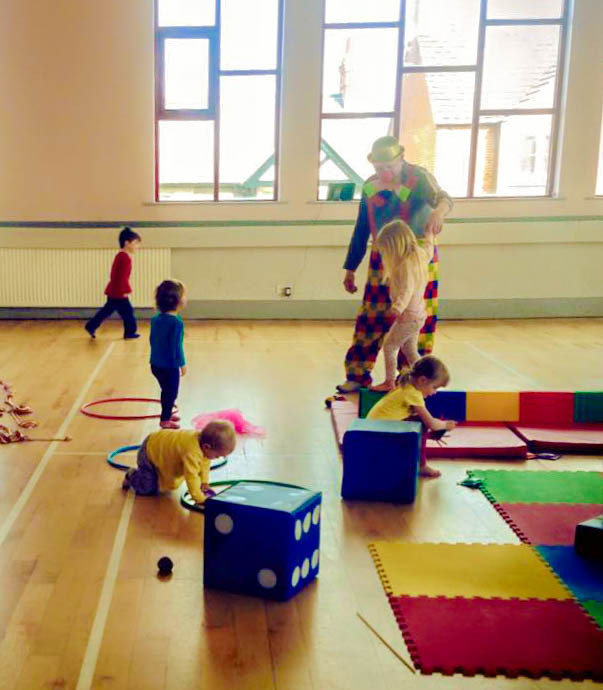 Circus Tots is a parent and child play group for pre-school children. We create a safe environment where you can play with your child in the colourful world of circus. Silly Billy The Clown from The Circus School will be on hand to help with plate spinning and juggling, so it is a fun activity for the children and parents. We also have circus music playing throughout the session to create the atmosphere. We have multi coloured beams to help with balance, bean bags to throw & catch for coordination, a see-saw where you child puts one foot on each side and learns to balance and rock, spinning plates, hula hoops, soft play foam shapes to stack, inflatable ball pit with padded floor, a small clown bouncy castle, foam circus animals to sit on or slide down, and ribbons to twirl! The duration of the session is 1 hour at a cost of £5 per child and £1 per additional sibling. Sessions take place at venues in and around Northamptonsire. If you have a child who is already at school then they can join Circus Club or Youth Circus at The Circus School which is based at Caroline Chisholm School in Wootton, Northampton. Here they will learn more advanced circus skills such as how to walk the tightwire, balance on a walking globe, swing on a trapeze and much more! Click here for times and prices.